Click or tap the appropriate letter to jump to your desired magnetics terms. An iron-core transformer for use with audio-frequency currents to transfer signals from one circuit to another. Used for impedance matching to permit maximum transfer of power. 1. A transformer with a single winding (electrically) in which the whole winding acts as the primary winding, and only part of the winding acts as the secondary (step-down); or part of the winding acts as the secondary (step-up). 2. A voltage, current, or impedance transforming device in which parts of one winding are common to both the primary and secondary circuits. A transformer with mounting holes on either the brackets or frame so it can be attached directly to the assembly, as shown below. Chassis-mount transformers may be large or small. Also called an impedance coil. An inductor (reactor) used to limit or suppress the flow of alternating current without an appreciable effect on the flow of direct current. 1. The magnetic material placed within a coil to intensify the magnetic field. 2. Magnetic material inside a relay or coil winding. That length of time that an insulation material withstands the action of a specified level of field-intensified ionization that does not result in the immediate, complete breakdown of the insulation. Also called ionization resistance, brush discharge resistance, or slot-discharge resistance. A shield placed around a high potential point to redistribute electrostatic lines of force and prevent corona. The movement of electrons through a conductor. Current is measured in amperes. A transformer, intended for measuring purposes, designed to have its primary winding connected in series with a circuit carrying the current to be measured or controlled. The voltage between two electrodes at which electric breakdown of the specimen occurs under prescribed test conditions. Also called electric breakdown voltage, breakdown voltage, or hi-pot. The maximum voltage a dielectric can withstand without rupturing. Usually expressed as volts per mil. Also called electric strength, breakdown strength, and electric field strength. The voltage produced in a coil as the number of magnetic lines of force (flux linkages) passing through the coil changes. 1. The process of charging an object electrically by bringing it near a charged object. 2. Capacitive induction of interfering signals over an air gap separating an instrument (e.g. from its wiring or housing). A shield which prevents electrostatic coupling between circuits but permits electromagnetic coupling. A protective coating of cured plastic placed around delicate electronic components and assemblies. It is identical to potting, except the cured plastic is removed from the mold. The plastic therefore determines the color and surface hardness of the finished part. The molds may be made of any suitable material. An insulating plastic used for encapsulating or embedding electronic equipment. A powdered, compressed, and sintered magnetic material having high resistivity, consisting chiefly of ferric oxide combined with one or more other metals. The high resistance makes eddy-current losses extremely low at high frequencies. Examples of ferrite compositions include nickel-ferrite, nickel-cobalt ferrite, manganese-magnesium ferrite, yttrium-ion garnet, and single-crystal yttrium-ion garnet. A transformer consisting of a coil wound around a core made from iron and/or other oxides that have been sintered into a magnetic material having high resistivity (ferrite). Longer lead time to obtain material for production. High-frequency applications, such as switched-mode power supplies. A laminated transformer designed so the core reaches a point of magnetic saturation. Ferro-resonance occurs when the transformer core is so strongly magnetized that increased winding current provides virtually no increase in magnetic flux. Because of this, the voltage output remains constant even when there are significant variations in voltage input. The core saturation in resonant transformers creates an energy reserve in its resonant tank circuit, which may reduce incidents of transients and surges. Normally an iron-core coil that allows direct current to pass while opposing the passage of pulsating or alternating current. A sinusoidal wave having a frequency that is an integral multiple of the fundamental frequency. For example, a wave with twice the frequency of the fundamental is called the second harmonic. 1. The production of harmonic frequencies at the output by the non-linearity of a transducer when a sinusoidal voltage is applied to the input. The amplitude of the distortion is usually a function of the amplitude of the input signal. 2. A condition that exists in the output of an amplifying circuit when harmonics, added during the process, alter the signal waveform. Abbreviated H. The basic unit of inductance in which an induced electromotive force of one volt is produced when the current is varied at the rate of one ampere per second. 1. See Dielectric Breakdown Voltage. 2. Contraction of high potential. Commonly refers to a device used for testing insulation breakdown or leakage, with high voltages. Hi-Potting is the verb. 1. The establishment of an electric charge of a magnetic field in a substance by the proximity of an electrified source, a magnet, or a magnetic field. 2. The setup of an electromotive force and current in a conductor by variation of the magnetic field affecting the conductor. 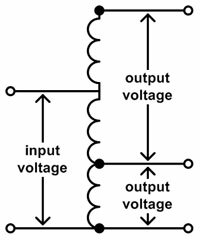 A transformer that transfers energy from an alternating voltage source to the input of a circuit or device. It also usually provides the correct impedance match. A number of electrical elements comprising a single structure that cannot be divided without destroying its stated electronic functions. A coil in which iron forms part or all of the magnetic circuit, linking its winding. In a choke coil, the core is usually built up of laminations of sheet iron. A transformer in which iron forms part or all of the magnetic circuit, linking the transformer windings. A transformer designed to provide magnetic couplings (flux couplings) between one or more pairs of isolated circuits, without introducing significant coupling of any other kind between them (that is, without introducing either significant conductive (ohmic) or significant electrostatic (capacitive) coupling. Kilovolt-Ampere, 1,000 volt-amperes. See Volt-Ampere. An iron core for a coil, transformer, armature, and so forth. It is built up from laminations to minimize the effect of eddy currents. The sheet iron or steel laminations are insulated from each other by surface oxides or by oxides and varnish. A single stamping of sheet material used in building up a laminated object such as the core of a power transformer. The path of the flux as it travels from the north pole, through the circuit components, and back to the north pole. In a generator, the magnetic-circuit components include the field yoke, field pole pieces, air gap, and armature core. The magnetic circuit may be compared to an electrical circuit, with magnetomotive force corresponding to voltage, flux lines to current, and reluctance to resistance. The magnetic induction in a material. An electromotive force will be induced in a conductor placed in a magnetic field whenever the magnitude of the flux changes. The condition that exists when two coupled circuits are adjusted so that the impedance of one circuit equals the impedance of the other. A transformer used for matching impedances. Abbreviated mA. One one-thousandth (0.001) of an ampere. Abbreviated mH. One one-thousandth (0.001) of a henry. Typically written as the Greek letter µ. 1. Symbol for amplification factor. 3. Abbreviation for prefix micro-. (µA – micro-ampere, µH – microhenry, µmho – micro-mho, µohm – micro-ohm, µsec – micro-second, µV – microvolt, µW – microwatt. Symbolized by the Greek letter omega (Ω). The unit of resistance. It is defined as the resistance, at 0°C., of a uniform column of mercury 106.30 cm long and weighing 14.451 grams. One ohm is the value of resistance through which a potential difference of one volt will maintain a current of one ampere. A sensitivity rating for voltage-measuring instruments. (The higher the rating, the more sensitive the meter.) On any particular range, it is obtained by dividing the resistance of the instrument (in ohms) by the full scale voltage value of that range. A transformer used for coupling the plate circuit of one or more power tubes to a speaker or other load. A non-powered component generally presenting some loss (expressed in dB) to a system. A ferrite magnetic core that has the shape of a pot, with a magnetic post in the center and a magnetic plate as a cover; the coils for a choke or transformer are wound on the center post. A transformer used for raising or lowering the supply voltage to the various values required by the load. Abbreviated pri and symbolized by P. Also called a primary winding. The input transformer winding that carries current and normally sets up a current in one or more secondary windings. The voltage applied to the terminals of the primary winding in a transformer. A transformer designed to pass pulse currents and voltages with the least possible changes in wave-shape, or to be used for generating pulses in a blocking oscillator. A transformer for adjusting the voltage or the phase relation (or both) in steps, usually without interrupting the load. See Ferro-Resonant Transformer. The effective value of a varying or alternating voltage. The value that would produce the same power loss as if a continuous voltage were applied to a pure resistance. In sine-wave voltages, the rms voltage is equal to 0.707 times the peak voltage. The transformer output winding where the current flow is due to inductive coupling with the primary winding. The voltage across the secondary winding of a transformer. The winding on the output side of a transformer. The connecting of components end-to-end in a circuit, to provide a single path for the current. A circuit in which resistances or other components are connected end-to-end so that the same current flows throughout the circuit. The ratio of the power at the fundamental frequency measured at the output of the transmission system considered, to the power of any single harmonic observed at the output of the system because of its nonlinearity, when a single-frequency signal of specified power is applied to the input of the system. It is expressed in dB. The most simple transformer design, consisting of one set of conductors wound around a single core. An equal division of a winding that will allow series or parallel external connection of the divided winding (four external leads) of a servomotor. 1. For a magnetic material in a symmetrically cyclically magnetized condition, the ratio of the flux density at zero magnetizing force, to the maximum flux density. 2. The ratio of the flux density to the maximum flux density when the magnetizing force has changed halfway from zero toward its negative limiting value. A square or rectangular-shaped periodic wave that alternately assumes two fixed values for equal lengths of time, the transition time being negligible in comparison with the duration of each fixed value. A transformer in which the voltage is reduced as the energy is transferred from its primary to its secondary winding. The result is an increase in current. A transformer in which the voltage is increased as the energy is transferred from its primary to its secondary winding. The result is a decrease in current. A method of mounting a transformer on a printed circuit board by soldering the component directly on a “solder pad” on the board. A transformer made for surface mounting has flat pads or “feet” to solder to the circuit board, as shown below. An iron-core choke coil designed so that its effective inductance varies with the current passing through it. It is used as the input choke in some power-supply filter circuits. A coil winding with connections brought out from turns at various points. A winding added to a transformer, in addition to the conventional primary and secondary windings, to suppress third harmonics or to make connections to a power-factor correcting device. A sine-wave component having three times the fundamental frequency of a complex wave. A transformer that consists of three AC voltages with a phase differential of 120 electrical degrees between any two adjacent voltages or currents. The three separate outputs are from a single source. A method of mounting a transformer on a printed circuit board by inserting pins on the bottom of the unit through holes in the board. A transformer made for through-hole mounting has pins at the bottom of the unit, as shown below. 1. A surface, or its closed solid, generated by any closed plane rotating about a straight line in its own plane—the resulting configuration being ring-shaped. 2. A highly efficient type of coil wound upon a ring-shaped core. The toroid provides for a highly concentrated magnetic field, within itself, and has a mini-magnetic flux leakage (external field). A transformer with the primary and secondary coils wound around a ring-shaped core, which is typically made out of silicon steel, permalloy, or a sintered ferrite. A coil wound in the form of a toroidal helix. An electrical device that, by electromagnetic induction, transforms electric energy from one or more circuits to one or more other circuits at the same frequency, but usually at a different voltage and current value. The ratio of the root-mean-square primary terminal voltage to the root-mean-square secondary terminal voltage under specified conditions of load. A unit of apparent power in an AC circuit containing reactance. It is equal to the potential in volts multiplied by the current in amperes, without taking phase in to consideration. True power delivered to the load may be lower than VA (apparent power) in the output circuit. 1. Electrical pressure, i.e., the force that causes current to flow through an electrical conductor. 2. Symbolized by E. The greatest effective difference of potential between any two conductors of a circuit. 1. A unit of the electric power required to do work at the rate of one joule per-second. It is the power expended when one ampere of direct current flows through a resistance of one ohm. 2. Practical unit of electrical power. In an alternating-current circuit, the true power in watts is effective volts multiplied by the circuit power factor. There are 746 watts in 1 horsepower. A conductive path, usually wire, inductively coupled to a magnetic core or cell. Windings may be designated according to function (such as sense, bias, drive, and so forth).